Under favourable atmospheric conditions any elevated structure can generate upward lightning flashes. Even aircraft can do so – in fact, height and movement are two of the factors that contribute to this phenomenon. The tips of wind turbine blades move at speeds of several tens of metres per second. However, no one had previously demonstrated the relationship between this movement and the triggering of electrical discharges. Through its lightning mapping array located in the Terres de l’Ebre region of Tarragona, the UPC’s Lightning, Atmospheric Electricity and High Voltage Research Group (LRG) has detected electrical discharges from wind turbines that are repeated periodically. The duration of these discharges ranges from a few minutes to over an hour, depending on the storm conditions. Researchers have made high-speed video recordings of lightning flashes caused by wind turbines on the Rubió wind farm. 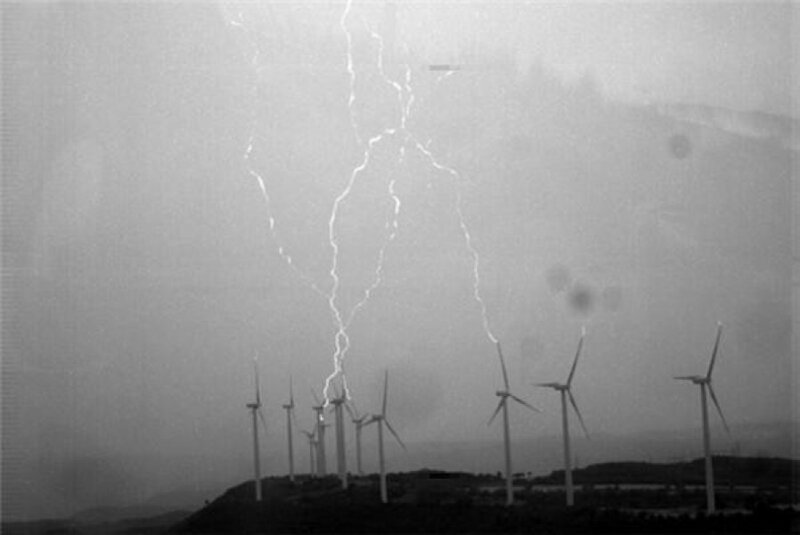 The LRG, which is a European benchmark in lightning studies, has recorded several upward lightning flashes caused by rotating wind turbines under clouds. These recordings were made at a distance of one kilometre from the wind turbine, with the camera set at a speed of 6668 frames per second and a resolution time of 150 microseconds. The LRG’s work will be very useful because it will help describe the phenomenon and establish prevention systems. Though it occurs on a daily basis, lightning is still one of the least known atmospheric phenomena. The study of lightning generated by the wind turbine blades and its relationship with the frequency of rotation will help characterise and define flashes, and above all prevent them. It will also reduce costs for turbine manufacturing companies and wind energy generation companies, which lose millions of euros every year in damage caused by lightning. Wind turbine blades are currently over 60 metres long and the nacelle can be located over 100 metres from the ground. The blades are made of composite materials that are very sensitive to the effects of electric discharges and lightning. Depending on the region in which the farm is located, the damage can be severe. On the west coast of Japan, for example, winter lightning is far more harmful than summer lightning. In fact, some wind farms have been forced to close because of storm damage. The LRG is the only group in Europe studying lightning scientifically and systematically. They have set up observatories in the Pyrenees, the Ebro Delta and the island of San Andrés in the Colombian Caribbean. Their expertise has led them to participate in the European Space Agency’s Atmosphere-Space Interactions Monitor (ASIM) project, which will give them access to new knowledge and allow them to advance in this area of science. In this project, they will study terrestrial gamma-ray bursts, high-energy ray emissions and unusual high-altitude phenomena associated with lightning: giant jets of electrical discharge and sprites, which occur in the stratosphere and mesosphere above thunderstorms. In the ASIM project, the LRG has received the support of the Spanish Ministry of Economy and Competitiveness in recent years. The group’s state-of-the-art equipment includes three high-speed cameras that capture 500,000 images per second; interferometers for studying what happens inside clouds; and the Lightning Network Mapping Array, which can characterise the evolution of lightning in three dimensions. The above story is based on materials provided by Universitat Politècnica de Catalunya (UPC). Note: Materials may be edited for content and length.